Below, more notes on what’s going on out there. Transit: Metro routes are starting to be affected by accumulations on streets — especially Eastside routes. You can check your bus route’s status on the Metro Snow & Ice page. UPDATE: Metro buses are having traction problems in some areas and there are reports of coaches stuck in various places around the Hill causing traffic back-ups as following coaches wait to pass — or not pass for the trolley lines. A 43 was stuck at 19th and John earlier in the morning while a 12 bus making the right turn onto E Madison lost traction and was causing a mess around 6:45 AM. Elsewhere, CHS saw dozens of coaches in action and delivering thankful passengers. Streets: There are a few cameras out of commission during streetcar construction but you can see the conditions on a few main streets in the area and on I-5 on the CHS Traffic Cams page. UPDATE: SPD is closing Aloha between 10th and 12th due to sliding cars. Meanwhile, back-ups caused by stuck buses are causing problems along routes such as the detoured #43 sitting at 19th Ave and E Madison. Side streets: Remember that side streets will not be cleared and may be covered with snow even when an artery route is clear. Schools: Seattle Public Schools are starting two hours later on a day already scheduled to end early. AM/PM kindergarteners and SPS preschoolers go free all day. Find out about area closures on the Seattle Public Schools Alerts page. Air travel: Headed, Santa help you, to Sea-Tac? Here’s the airport’s status page. If you can, stay home Friday and don’t drive. SDOT said Thursday it was “pre-treating” its snow routes overnight. 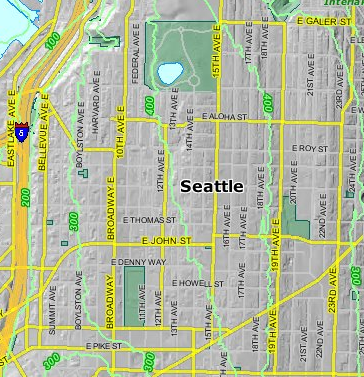 You can see the SDOT Winter Weather Response map here. Metro Transit service may be affected by snowy or icy conditions overnight Thursday to late Friday morning. Check timetables for planned snow routes. “It’s exciting, we gotta enjoy it while we can,” said Becky, who was out for a walk in Broadway Hill Park at about 8am with Steven and their canine companion Maggie. “I don’t work until 4pm,” Becky, whose commute was not impacted by the snow due to her schedule, said. “It’s kind of cheesy, but, last night, on Facebook, I was like, ‘I want a Christmas miracle!’ and this morning I woke up and there was snow!” Caroline said. “So that’s pretty awesome; that never happens.” The transplant to Seattle from Oklahoma was playing in the snow in Cal Anderson Park with her dog Solie at about 8:30am Friday. She has only been in Seattle for a couple of years and has yet to see any major snowfall. “We like it,” June said. “We don’t have to drive, so it’s no problem for us.” June was out with Don and their canine friends Hiwa and Tiki, romping in the snow in Bobby Morris Playfield in Cal Anderson Park at about 8:30am Friday. The pair are originally from Hawaii. Making a snowman? No, it’s was an epic snowball fight, CHS quickly realized. Students Rowan and Wynn took advantage of the late starts at their schools this morning to have fun launching giant snowballs at each other in Bobby Morris Playfield in Cal Anderson Park at around 8:30am Friday. Seattle public schools, along with some other area schools including Capitol Hill’s Seattle Academy of Arts and Sciences, started two hours late Friday morning due to the flurry. There were a lot of firsts this morning for Ed, a recent transplant to Seattle from Melbourne, Australia. The engineer was planning to work from home “for the first time ever,” rather than brave his commute out of the neighborhood, he said. He was also experiencing snow in a place where he lives for one of the first times in his life, he said, as he made snowballs in Cal Anderson Park at about 8:30am Friday. “Everyone is a friend today,” Ed said, grinning and packing together a large snowball with his hands. The commute was pretty clear this morning for Ivan, who was on his way to work. The only sticky part was getting down the driveway of his house on Tiger Mountain in Issaquah, where there was about three to four inches of snow, he said. “I had to have [it in] four wheel,” Nick, who lives up a partially dirt road and drives a Jeep, said. A Seattle resident for 10 years, he also lived in San Franciso and on the East Coast of the US for a number of years, and is originally from Denmark, he said. Cody, who had been out since 5am making deliveries for Cupcake Royal when CHS talked to him just before 9am, said this morning’s snow had not caused him any trouble. Even Denny’s steep grade, infamous for being trouble for motorists (and sometimes a blast for a sledders) in the snow, was smooth sailing, he said. Quincy, who commuted to Capitol Hill from Bremerton this morning to get to class at the Gary Manuel Aveda Institute at 10th and Pike, said the snow did not cause her too much trouble. She did have to take an alternative bus, however, when the 12 was rerouted or delayed, she said. Quincy said she had to walk “five or six blocks” from the Swedish campus on First Hill, as close as the alternative bus route she took could get her. “Not too bad…I stepped in a few puddles,” she said. Classes started late at the Institute this morning due to the snow, Quincy said. Original report 12/18/13: OK. So the last all-caps warning about possible snow in Seattle didn’t result in anything but a storm of excitement on Facebook. That time around, we only had the cold part of the equation. Thursday night into Friday morning should be a different story. MODEL GUIDANCE AND SATELLITE IMAGERY CONTINUES TO SUGGEST THURSDAY WILL BE A COLD AND CLEAR DAY. HIGHS WILL BE MAINLY IN THE 30S AND A NORTH BREEZE WILL MAKE IT SEEM COLDER. AND REACH SEATTLE AROUND 12Z. SNOW WILL CONTINUE UNTIL 18Z-20Z THEN IT WILL CHANGE TO RAIN AS WARM AIR MAKES ITS WAY INLAND. THE CASCADES AND TO THE FAR NORTH. AMOUNTS TAPER TO THE SOUTH WHERE WARM AIR ARRIVES SOONER. TACOMA GETS AROUND 2 INCHES…OLYMPIA AND POINTS SOUTH AROUND 1 INCH. THE CURRENT WINTER STORM WATCH IS GOOD. TO HIGHLIGHT THE POTENTIAL SNOW PROBLEMS. Much nicer than what happened that December 19th. And, Santa help you, headed to Sea-Tac? Here’s the airport’s status page. CHS will be around to cover whatever happens this year, of course. Here are a few links you might find handy in planning your day. 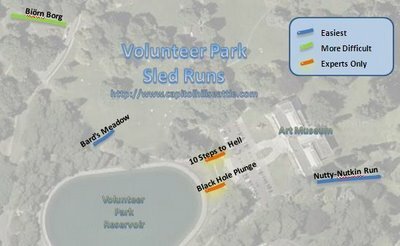 The highest point on Capitol Hill, Volunteer Park, at 453 feet above sea level, is #5 on the list of Seattle’s highest elevations. King County maps shows the range of elevations across the Hill from 200 feet down in I-5 Shores to 300 feet on Broadway and 400 feet above 12th. This is useful for both your snow planning and your small plane piloting. Make a note of it. Don’t try to drive down Aloha hill. Pedestrians are not required to help you push your car if you do. Get the garbage bags ready…er…I mean…sleds, yeah, get the sleds ready. Maybe these fu$&ers will stop whining about seattle drivers once they get a big delicious glass of snow on hills. Flat-landers never understand. Thank you so much for the beautiful pictures. Very pretty this morning and lots of laughter in the park. And…HA ha ha…a guy just went by on skies. Doing pretty well, too! I love this town. Thanks for the heart warming photos! FUN FUN!